Cheesy Meatball Skillet Dip is a quick appetizer that your guests will love. 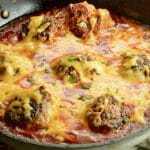 Tender meatballs, with a light tomato sauce with lots of melty cheeses for complete comfort food. Cheesy Meatball Skillet Dip is an appetizer that you can make after a long day of work and still have plenty of time to be ready for when company comes over for happy hour or just for an evening of game night games. 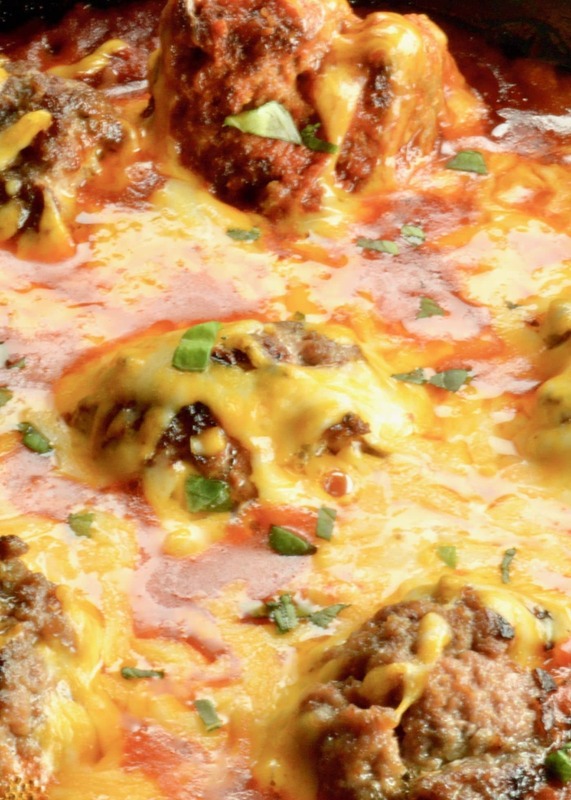 Its comfort food at its best, melty cheese, with even more cheese in juicy light meatballs. All mixed with a light tomato sauce. Use meat with a little more fat. (90/10 meat will be much more dried out than 80/20). In my recipe I mix both pork and beef so there is ample fat, but it doesn’t taste greasy at all. Mix the meatballs with your hands and don’t overpack them. The goal is to hold them together but not make them packed so tight that they aren’t too tough. Make sure to make a test meatball. My recipe includes seasoning that should work, but make a test meatball and taste it and adjust your seasonings accordingly! Need a time saver? I give you a recipe to make your own tomato sauce, but I have been known on occasion to use our favorite spaghetti sauce to make this dip. (I have an Italian friend who is gasping now that I would suggest store-bought. )But I get it, there are times when you just need your dip ready to serve in time and you don’t always have the time to make your own! Our personal favorite at the moment is Classico Tomato Basil Sauce! You can partially make this dish ahead. 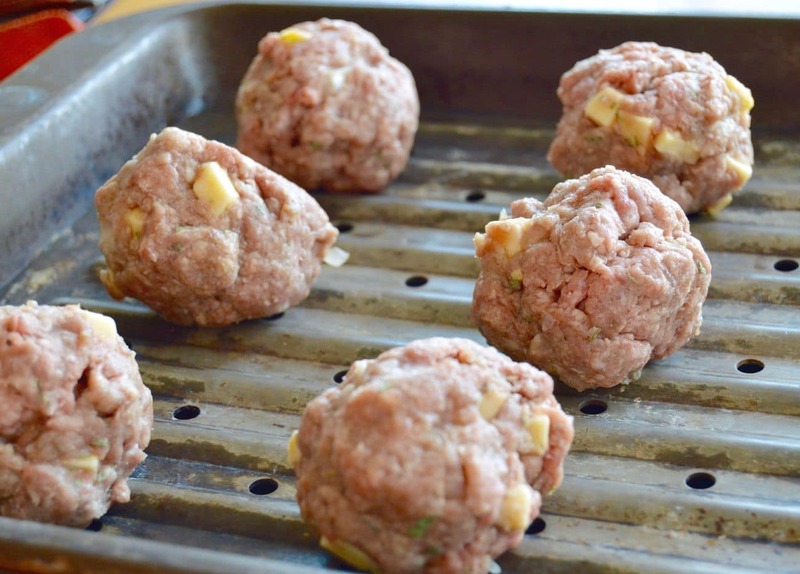 Make the meatballs, cook the meatballs in the oven and hold off on sprinkling the cheese. You store the recipe up until this point in the fridge and then just reheat and put the cheese on in the last baking. I love meatballs, and have several other meatball recipes that you may enjoy for an appetizer. My number one Meatball recipe is from a review I did from my friend Char from Wok and Skillet’s cookbook. Her recipe for Chinese Pork Meatballs is so so good! Check out my Bacon Wrapped Blue Cheese Meatballs, The IKEA copycat Swedish Meatballs or for a healthier option try these Buffalo Chicken Meatballs! If those aren’t enough meatballs for you, I also have a meatball round-up with a lot more recipes here! Using your hands mix together beef, pork, heavy cream, beaten egg, oregano, and panko bread crumbs. Then sprinkle gouda cheese cubes over the top and mix gently. Use a lighter hand to blend evenly. You can test cook one meatball ahead of time here to make sure it is seasoned correctly. Adjust seasonings as needed. Form meat into bite sized balls (about 1inch in diameter), packing them gently but enough to hold them in a ball shape. Place on plate and place in fridge to chill to set shape while you make the tomato sauce. Once meatballs are chilled, place meatballs on a roasting pan and cook them for about 15 minutes. Then set aside until sauce is ready. In a saute pan heat to medium high. Add olive oil and sauce minced onion until translucent. (about 4 minutes). Add Garlic and saute for 2 more minutes. Once sauce is done, place meatballs in an ovenproof skillet/serving dish (one that you will serve from) Then pour hot sauce over the top. Cook in oven for 10 minutes. Remove from the oven, raise the oven temp to 400°. Sprinkle cheese over the top of the meatballs. Cook for about 10 more minutes, watching carefully so the cheese does not burn. Bake until cheese is bubbly and golden brown. Serve with herb toasts or garlic bread immediately. 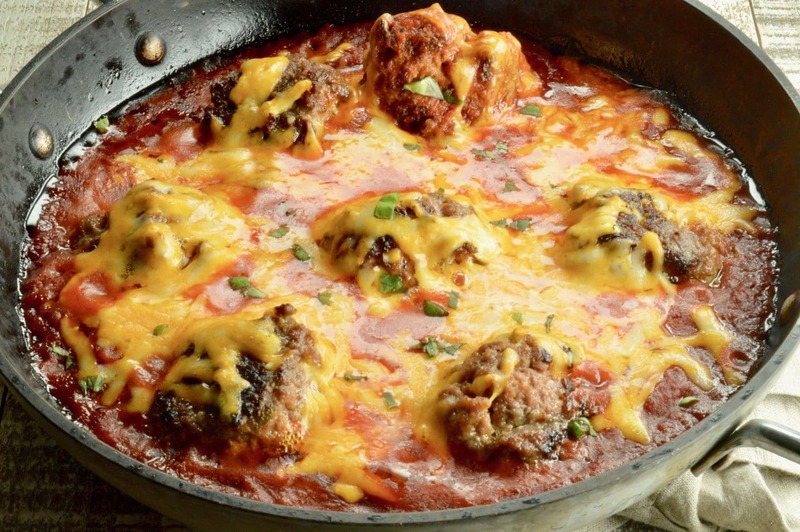 I can’t think of anything better than meatballs and cheese and this dish is perfect comfort food. Welp, looks like I have a recipe for the next game day! This is incredible! I love homemade meatballs, and cheesy ones?! This would be a big hit in my home! Mmmm. These meatballs look fabulous! I love the sauce and the cheesy goodness! I want to take a piece of bread and dip it in the sauce. Yum. Wow, party in a skillet. Fantastic for a gathering of meat lovers! Yes! Its meaty and cheesy in every bite!